This easy and delicious Banana Cinnamon Parfait is as healthy as it is delicious, making it a perfect Whole Food Plant Based breakfast or dessert. 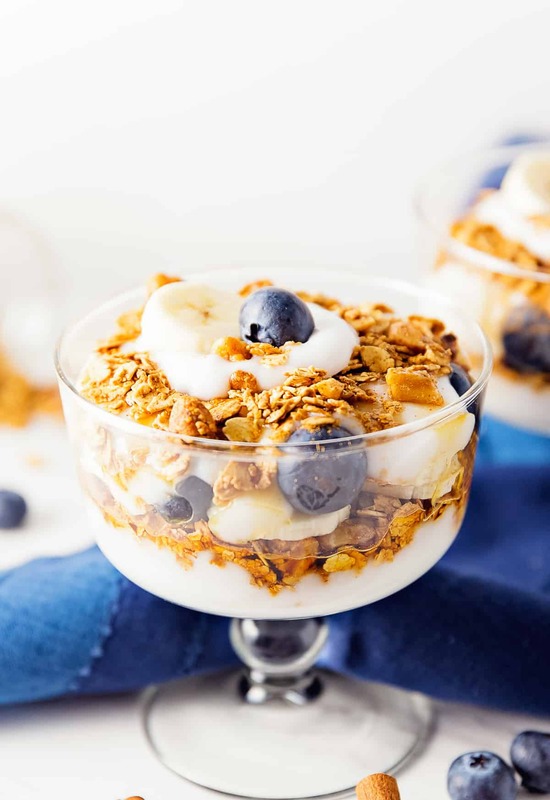 Made with bananas, blueberries, cinnamon, plant-based yogurt, and a tasty granola consisting of slivered almonds, chopped walnuts, rolled oats, cinnamon, and hint of maple syrup. No oil, no refined sugar, no highly processed ingredients, and gluten free. Plant-based yogurt parfaits are my thing. I could eat them 24/7. I love them for breakfast as well as a dessert. To me, they are simply yummy. 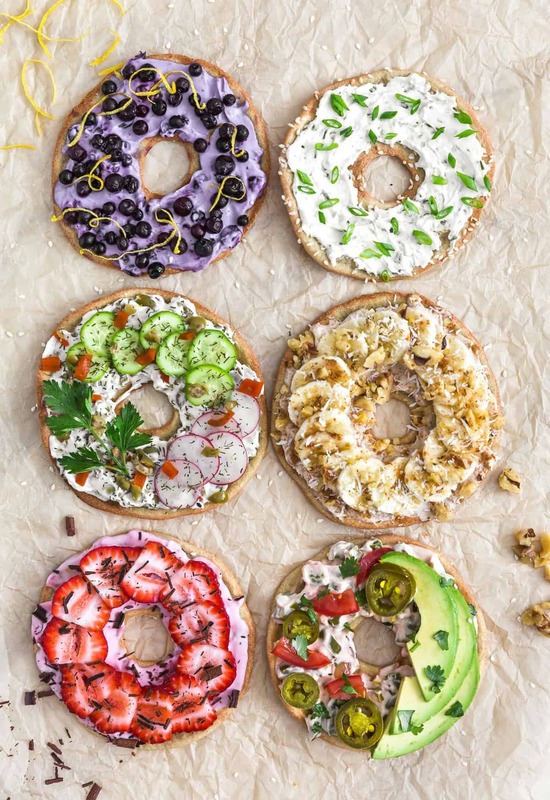 If you are looking for something tasty to transition the kids (or adults) over to the Whole Food Plant Based lifestyle, then this is a good recipe to start with. The light sweetness of our Simple Granola is a nice contrast to the plain plant-based yogurt. 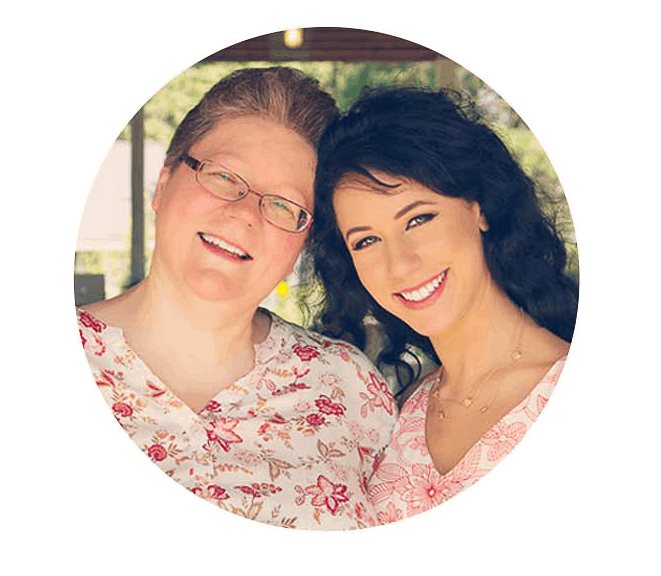 It takes time for the Western palate to adjust and accept less sweet dishes, as the Western diet is heavily laden with sugar. It won’t happen overnight. Our food is so sweet and filled with sugar that we often don’t even realize just how incredibly sweet our food has become. Our palate keeps adjusting and requiring more and more sugar just to get the sweetness to register on our tongue. Now how sad is that? 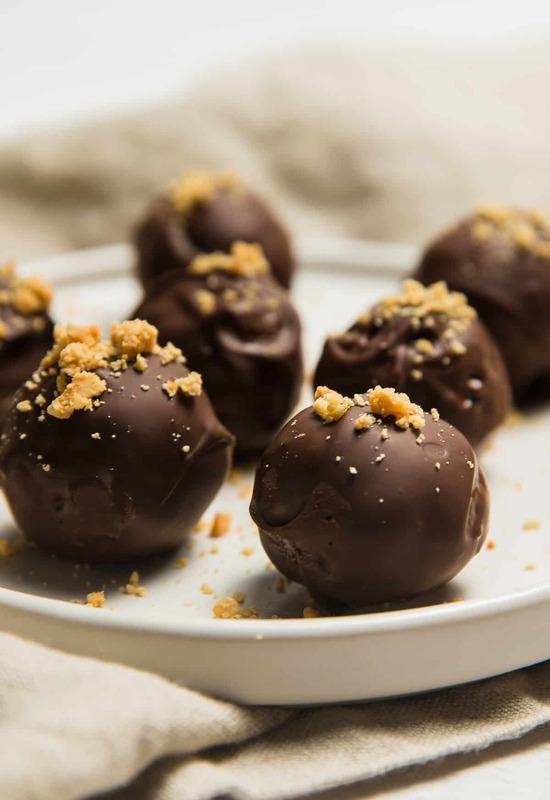 But we can help you reduce your tendency to crave sweet items with our recipes. 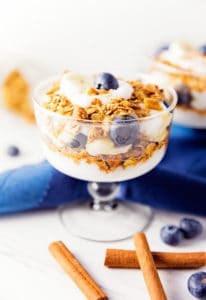 This healthier parfait is tasty and easy to make. The granola is homemade and is perfect for making breakfast and dessert parfaits. Our granola has just a hint of sweetness, coupled with a beautiful cinnamon component. The naturally sweet fresh fruit perfectly complements the plain plant-based yogurt. What is awesome about this recipe is that you can make individual servings in clear plastic cups with lids so the kids can take them to school in their lunchbox (don’t forget to include an ice pack to keep them cold). You can keep the granola separate (in a baggie) to add later if the kids don’t want the granola to soften. 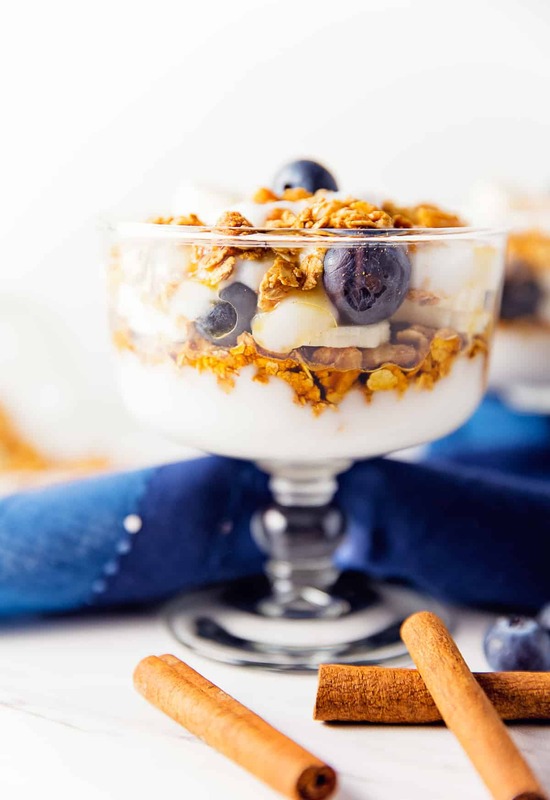 Granola parfaits are just the ticket when you are hungry and want something satisfying and fun. We love making them. The first time TP109 ate one he said “This is really tasty. I really enjoy the crunchy granola, it is not too sweet. It definitely doesn’t taste like McDonalds’ parfait.” Well now TP, that is the whole point, it is not supposed to overwhelm you with sugar, just a tiny bit of sweetness to make you feel satisfied, as well as make you feel like you treated yourself to something yummy, yet healthy! Place some yogurt into the bottom of a dessert cup. Lightly sprinkle some cinnamon over top. Lightly drizzle some maple syrup over top of the yogurt. Next sprinkle a handful of Simple Granola. 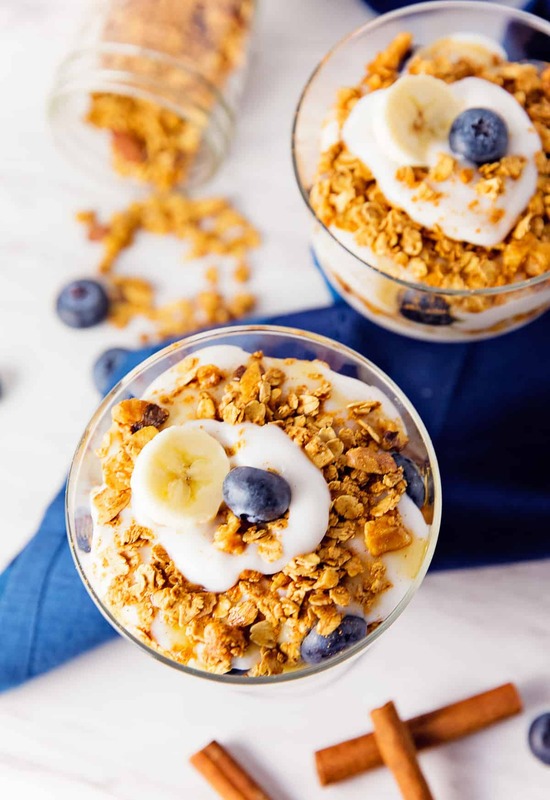 Place some sliced bananas and blueberries over top of the granola. Repeat starting with a smaller proportion of yogurt, cinnamon, maple syrup, granola and fruit. 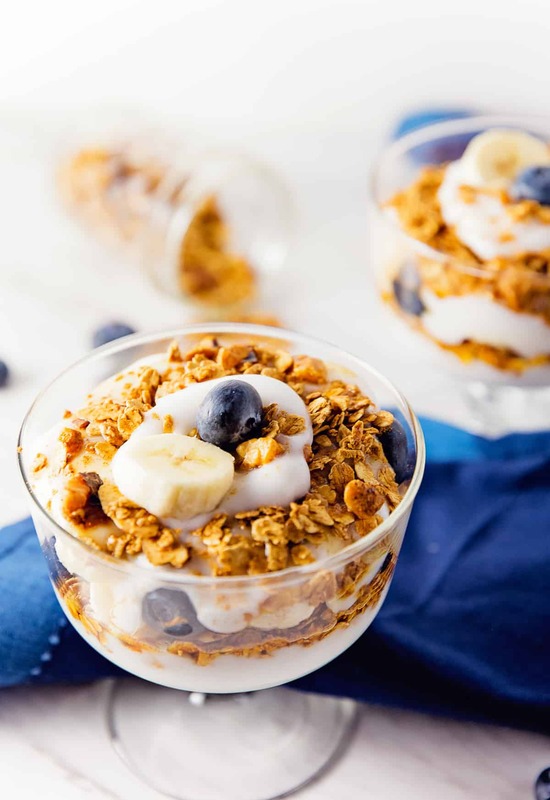 End with a tiny dollop of yogurt, tiny sprinkle of granola, and a blueberry. *Make ahead: These can be made ahead, but the granola will become soggy. If you enjoy crunchy granola, then make them right before serving. Storage: Store in a glass or plastic storage container. Eat within a week (additionally, review the expiration date of your plant-based yogurt as well). 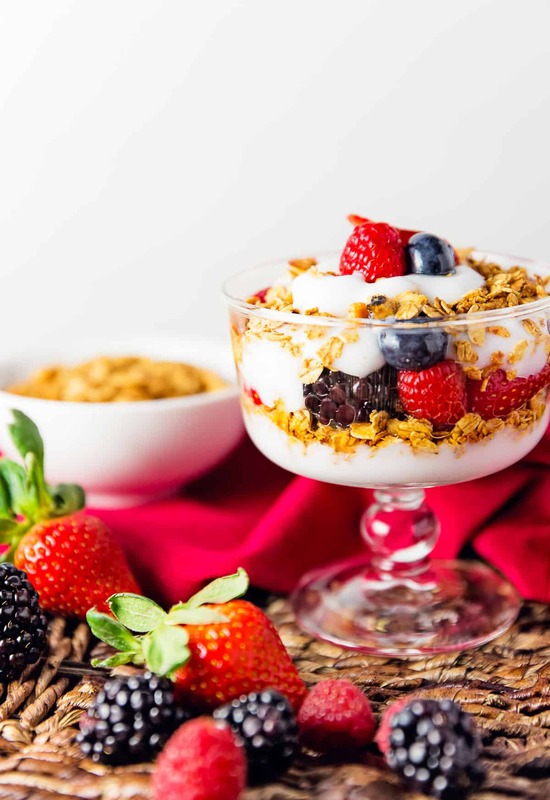 If you want to maintain the crunch of the granola, make the parfaits just prior to eating them. We love the granola crunch!